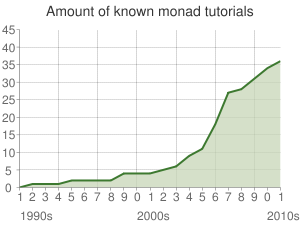 This is a comprehensive timeline of monad tutorials and related articles. Please update this list as it becomes outdated! If you find a tutorial, article, post, comment, or message that stands on its own as an explanation of monads, then please take a moment to paste the link somewhere on this page (register a throwaway account, if you prefer). The date, author, and blurb can be added later. This will greatly help others who are using this list as a resource for learning about monads. "Shall I be pure or impure?" ... "A monad is a triple (M; unit; *) consisting of a type constructor M and two operations of the given polymorphic types." "We describe the design and use of monadic I/O in Haskell 1.3"
"Once upon a time, people wrote their Haskell programs by sequencing together operations in an ad-hoc way." ... "For our purposes, a monad is a triple of a type and then> & return operators defined over it so that the following laws apply: ..."
"...monads can be used to implement several other programming features including: consuming input, producing output, exceptions and exception handling, nondeterminisim." "The definition of a monad is a slightly trimmed-down version of our Computation class. The Monad class has four methods ..."
A comprehensive introduction. Covers monad transformers and some common monads. An appendix presents monads as assembly lines. "A monad is a way to structure computations in terms of values and sequences of computations using those values." "The main insight of monads is that all side effects, from mutation to I/O to non-termination, have one thing in common: order of evaluation matters." ... "So monads are about talking about effects in the context of a pure semantics." "A monad is a container type together with a few methods defined on it. Monads model different kinds of computations." ... "it is more natural sometimes to begin with map (fmap), return and join"
"Essentially a monad is a hidden data structure (Fig. 1) which automatically passes state around for us. " "They let you chain pass [bind] operations together to make little computational pipelines, with rules of your choosing. They don’t manipulate values themselves — that’s the job of the blocks (functions) you plumb together using the monad." Functions are space stations, parameters are astronauts and monads are space suits that let us safely travel from one function to another. "What we need is some way to capture the pattern 'do X and then do Y, where Y may be affected by X'. Monads are the way we do this." ... "In a sense, each monad is its own little minilanguage specially suited for its particular task." Revised 2006-09 to include Meet Bob The Monadic Lover: "what monads look like and what they are useful for, from the perspective of a ... lover." "Writing introductions to monads seems to have developed into an industry," Dan (sigfpe) observes. He argues that monads are not "something esoteric in need of explanation", but walks you through the process of reinventing monads to solve some very basic and practical problems. "So now I can reveal what a monad is. The triple of objects (m,unit,bind) is the monad, and to be a monad they must satisfy a bunch of laws such as the ones you've been proving." "I think of monads as computational environments in which you get to make up the rules." ... "monads are ... a general model of computation that lets you pick and choose the environmental features that you want for your computations." Monad transformers are rarely covered in introductory tutorials. This "is not a paper about implementing transformers, but about using them to write elegant, clean and powerful programs in Haskell". Available as a 12 page PDF or .lhs file. This delightful "tutorial" presents monads as monsters which devour values, use them to feed other monsters and regurgitate them when slain. Monads can also be useful in Java! Author's Description: This crash course starts with an EASY! introduction to categories and functors, then we define a monad, then give some basic examples of monads in categories, then present monadic terminology as used in programming languages. Then I lie down in a dark room with a warm wet cloth over my eyes. A very straightforward presentation of monads. Notable for its "The whole point" section, which conveys why we bother with all this monad business. Wikibook rewrite of the original monads tutorial. Less fluff, more pedagogy. [In progress at the time of this writing]. From a discussion about monad tutorials on Haskell Café (the name is due to haskellwiki user 'Green tea'). "The best way to grok monads is to ... familiarize yourself with several common monads and their uses." ... "All that makes a monad, really, is that you can define two functions like unit and bind on them." "A monad is a triple (m, return, >>=), where: ..." ... "As we progressed, we saw that monads are most commonly used for two different purposes: structuring the control flow and describing imperative effectful computations (IO, State, IndentIO), and structuring data flow (Maybe, List, Dist)." "We aim to show you that a monad is often an obvious and useful tool to help solve a problem." "An alternative term is computation builder which is a bit more descriptive of what they are actually useful for." ... "In layman's terms, a monad is just a type for which the >>= operation is defined." Commentary on monad tutorials and why many may be so unhelpful. "What I term the 'monad tutorial fallacy,' then, consists in failing to recognize the critical role that struggling through fundamental details plays in the building of intuition." "Monads are about composing computational steps into a bigger multi-step computation." "When we have functions that produce values that are hidden inside boxes, we have a problem. ... Monads add a single function called join, which is used to flatten out the layers of boxes: ..."
Covers basics, with simple examples, in a for dummies style. Includes monad transformers and monadic functions. "Actually, programming monads is much like cattle driving! So, let's get started." This is written for someone who has a good understanding of the Maybe and List monads, but has gotten stuck trying to understand State... State monad is just an abstraction for a function that takes a state and returns an intermediate value and some new state value. A desperate (futile?) attempt to end the eternal chain of monad tutorials. "My goal is to teach others to help them understand the State monad. ... After this point, you should be able to easily understand the other monads." Explains the relationships between the various abstractions over side effects, namely applicative functors, arrows, and monads. Translates a simple Java class into a stack of monad transformers, with a metaphor about how monads are like conversations, and why this idea should be familiar to OO programmers. "What I am going to talk about is how to use monads to do something in Haskell that is easy to do in Java." ... "This is what different monads do: each comes with its own set of operations that are legal within the context that the monad is modeling." "monads are just applicative functors that support >>=. The >>= function is pronounced as bind." "Monads are a generalization of functions, function application, and function composition to allow them to deal with richer notions of computation than standard functions." "The original sentence is this: All told, a monad in X is just a monoid in the category of endofunctors of X, with product × replaced by composition of endofunctors and unit set by the identity endofunctor." "Monads are hard to describe because they don’t correspond to anything in our everyday experience" ... "A monad is an endofunctor together with two special families of morphisms, both going vertically, one up and one down"
"Monads are a powerful way of structuring functional programs"
"Monads are really about composing functions"
"A monad is a wrapper type around another type (the inner type), which adds a certain structure to the inner type and allows you to combine computations of the inner type in a certain way." "Monads are simply Applicative Functors, which also define some way of flattening nested monadic values, and shoving monadic values into monadic functions. Applicative Functors are..."
"it's best to think of a monad as representing some context. What do I mean by context? ..."
"Monads are conditional function calls"
"a monad is a certain type of context that provides two things: a way to put things into the context, and function application within the context"
"... The category that they form is called a Kleisli category, and it’s basically another way of looking at monads." "This is not a tutoral on monads, nor will I use any math terms here. This is for people who have learned enough about monads to use them, but want to get a better picture of what they’re doing and why they exist." 2013-04 Functors, Applicatives, And Monads In Pictures. 2013-05 Kleisli Composition à la Up-Goer Five. "I have identified three kinds of monads ... Monad as control of the sequencing ; Monad as control of side effects ; Monad as container"
This page was last modified on 28 November 2015, at 19:06.